Frank Morgan, master of the alto saxophone, was born December 23, 1933 in Minneapolis, Minnesota. He died on December 14, 2007, also in Minneapolis. His father, Stanley, was played guitar in the group “The Ink Spots”. Like father, like son, and by age two the younger Morgan was playing guitar also. When Morgan was seven, his father took him to meet Charlie Parker. As soon as Morgan heard Parker play, he decided that the alto sax was going to be his passion. Parker had him start on the clarinet, however, and it was almost two years before the boy was allowed to make the switch to the alto sax. When Morgan was fourteen, the family moved to California. On the recommendation of Benny Carter, Morgan began formal lessons on the alto with Merle Johnston. Eventually Morgan would go on to play with some of the finest jazz musicians around, people like Teddy Charles, Kenny Clarke, Wild Bill Davis, Leroy Vinnegar, and others. One unfortunate side effect of Parker’s early interest in Morgan was, Morgan picked up Bird’s fondness for heroin. After Parker’s death, Morgan was positioned to be “the new Charlie Parker”, a fact that, he later said, scared him to death and drove him to drugs, time and time again. Between 1955 and 1985, by his own count, Morgan spent all of twenty years in jail for drug use. In 1985, Morgan finished what would be his last stint in jail. He threw himself into his music and successfully re-established his career, in a big way. From then until his death in 2007, he recorded over a dozen albums as leader. The album I want to talk about this time is the 1996 Telarc release, “Bop!” which he recorded with the Rodney Kendrick Trio. “Bop!” gives us eight songs. The first, “Milano”, is from the pen of legendary pianist John Lewis, and Kendrick takes the piano part with aplomb. Meanwhile Morgan’s sax and Williams’ drums drive the music forward relentlessly. “Well You Needn’t”, one of the disc’s three songs from Thelonious Monk, is up next. I’ve never been a huge fan of Monk, but I have to say the boys did an excellent job on this, one of Monk’s more well known tunes. Kendrick once again shows his chops here, taking the notoriously hard piano part in stride, while Morgan and the others take a more melodic tack. One of Charlie Parker’s mellower classics, “K.C. Blues”, follows, with Morgan taking the lead this time, accompanied mostly by Lundy and Williams, with just an occasional hint of piano from Kendrick. This is a nice, quiet little song that is deceptively simple. The Dizzy Gillespie/Frank Paparelli classic, “A Night In Tunisia” is up next. This has been one of my favorite songs from the moment I first heard it, and this version more than does it justice. Morgan gives Kendrick some real room to stretch here, with a large solo about halfway through. Skipping ahead, we come to “Half Nelson”, the 1959 classic from Miles Davis. It’s interesting to hear the trumpet part taken by Morgan and his alto, but he does well with it. He gives it a lively, uplifting turn that makes for an animated eleven and a half minutes. The next-to-last song, “Lover Man”, is from a little-known trio of writers: Jimmie Davis, pianist Ram Ramirez, and Jimmy Sherman. At six and a half minutes, this is one of the shorter songs on the album. The guys are very restrained on this one, making it more suitable for late night listening when the evening is beginning to wind down. “Bop!” closes with a song that has become one of Thelonious Monk’s standards, “52nd Street Theme”. This lively piece is one of my favorite Monk compositions. Ray Drummond takes over bass duties on this one, and does a great job. Indeed, everyone steps up on this one and the result is that we are taken out in style. 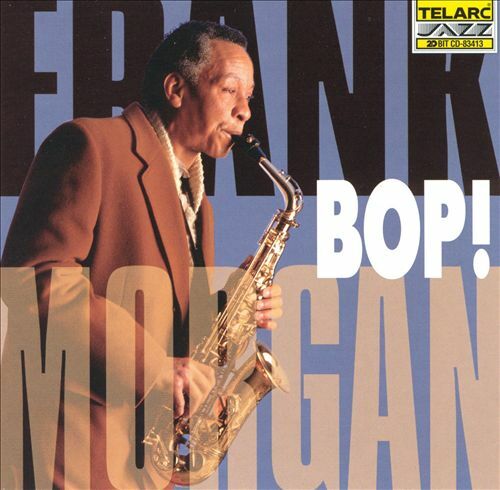 Frank Morgan’s “Bop!” is one album you do not want to overlook. It will make an excellent addition to your personal playlist, for a Saturday, or any other night! You can learn more about alto saxophonist Frank Morgan and his music by clicking the links below. His music is available for purchase and legal download at all the usual places. Brandt Reiter conducted an interesting interview with Frank Morgan, just three years before Morgan’s death. You can read it on the allmusic.com web site, here. Also on allmusic.com, Chuck Koton wrote a nice piece about the Frank Morgan Memorial Celebration that was held in Culver City, California on January 5, 2008. You can read his report here. NPR published a nice obituary after Morgan’s death, and you can read it here. Also included is a link to Morgan’s appearance on Marian McPartland’s Piano Jazz, originally broadcast on October 5, 2004.